Bach said at the time the IOC "welcomes very much" the intention of the two Koreas to jointly host the Olympics. The Koreas have never fielded a joint team at the Summer Olympics before. In February this year at the PyeongChang Winter Games in the South, the two sides combined their women's hockey teams for the first pan-Korean team in Olympic history. Building on that momentum, the Koreas competed as one at a few international table tennis tournaments that followed. Then at the 18th Asian Games in Jakarta and Palembang, Indonesia, in the summer, the Koreas sent joint teams in women's basketball, rowing and canoeing's dragon boat racing. They captured one gold and two bronze medals in dragon boat racing and silver in women's basketball. 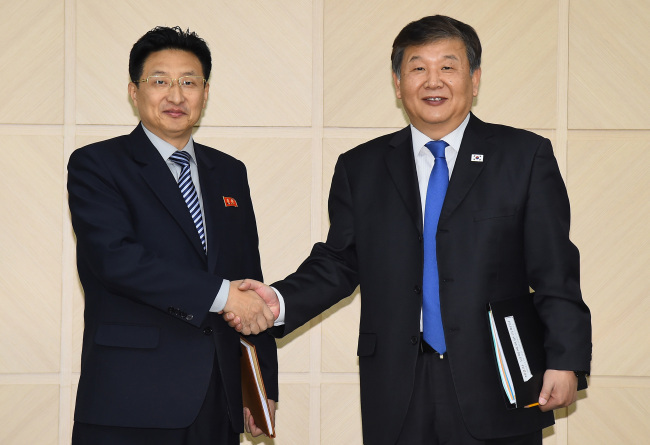 At the previous sports meeting on Nov. 2 in Kaesong, the two sides agreed to field a joint team at the men's handball world championships in Germany next month. North Korea hasn't been nearly as successful. It won two gold medals in Rio and four gold medals in London in 2012. Five of its 16 gold medals all-time at the Summer Olympics have come from weightlifting. When the unified teams won medals at the Asian Games this year, they didn't count toward the total of either South Korea or North Korea but were instead awarded to a new entity titled "Korea." The same procedure will likely apply in Tokyo. When the Koreas march in as one at the Tokyo 2020 opening ceremony, it'll be the 12th such occasion at an international multisport competition. They also paraded in behind the Korea Unification Flag at the opening ceremony for PyeongChang 2018 in February and at the Asian Games in Jakarta in August.